The 1980s were not a golden age of tall buildings in Toronto. Dozens of new office towers were built during the Decade of Greed, particularly in the downtown financial district, but despite the precedent set by recent landmarks such as the Toronto Dominion Centre, Commerce Court, and the Royal Bank Plaza, most were forgettable: either blankly banal late-modern glass boxes or post-modern confections encrusted with thick layers of historicist details and pointed party-hat roofs. 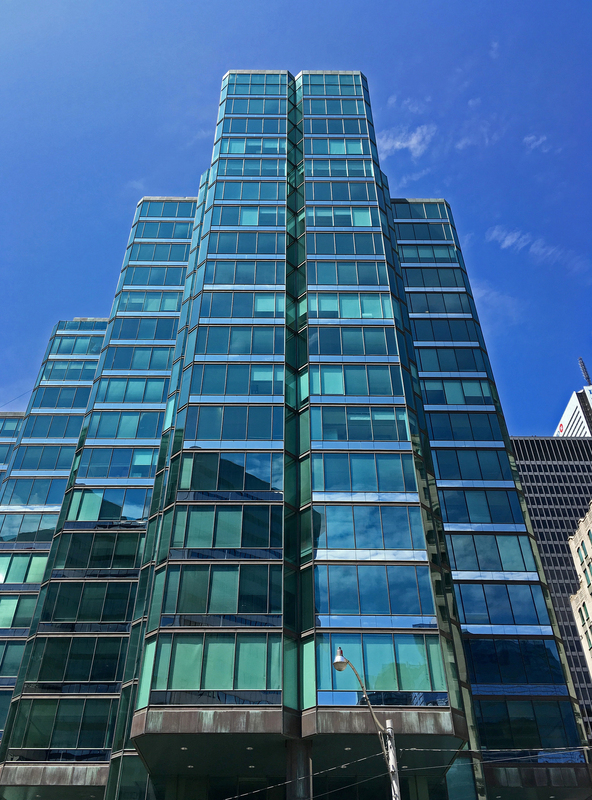 One University Avenue, completed in 1986 as Metropolitan Place, is one of the few distinguished towers from that period. 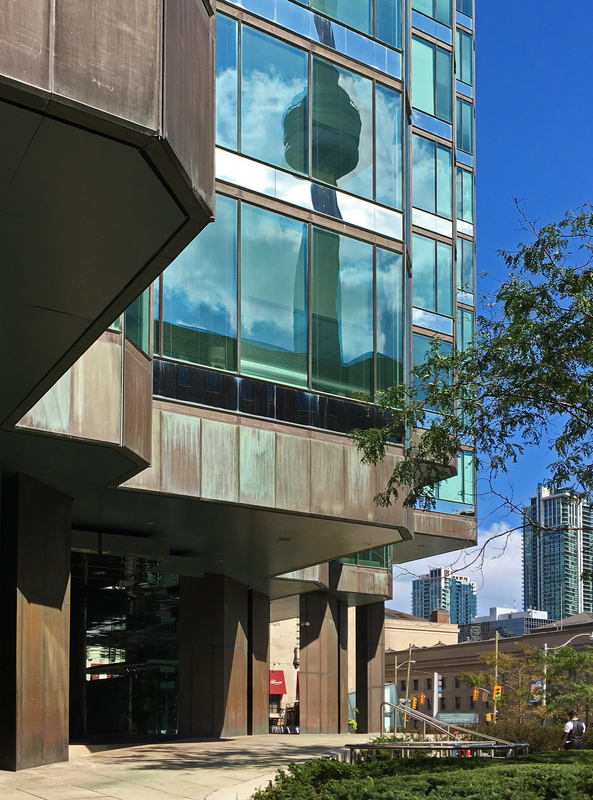 Working within the late-modern idiom and typical developer constraints, the Toronto firm of Brisbin Brook Beynon created an inventive, well-crafted building and an engaging urban realm at one of the city’s primary gateways. One University is notable first for its response to its site, a small but prominent triangle of land adjacent to the limestone monoliths of Union Station and the Royal York Hotel. The 19-storey tower’s massing follows the triangular site, its vertical ziggurat profile progressively staggered inward to form a blunt prow overlooking Front Street. 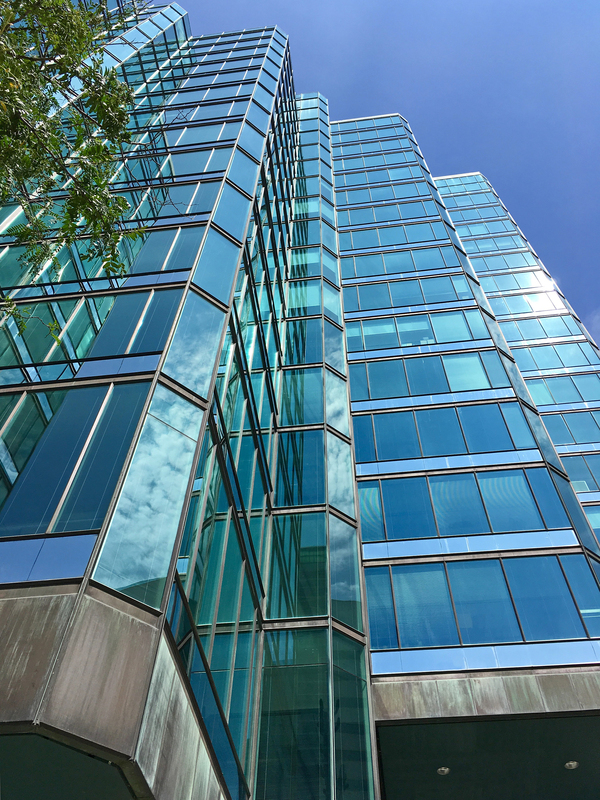 Structural modules are articulated as individual units, the edges elegantly chamfered, and are wrapped in a sleek blue-green glass membrane that effectively dematerializes the tower’s bulk. But, lest the surfaces simply dissolve into air, each floor level is demarcated by bands of polished stainless steel and weathered bronze, the bronze’s mottled texture and deep greenish-gold colour an unexpected and powerful foil to the glassy slickness of everything else. The entrance and elevated plaza further elevate 1 University beyond the norm. Heavy, robust pilotis clad in the same patinated bronze firmly anchor the tower to the land, both physically and metaphorically, and frame an entrance lobby that is both glass-walled and set back to visually open up the entrance plaza. A curving reflecting pool by the entrance casts watery lighting effects upon the lobby walls and ceiling. The plaza itself evokes a Canadian ruggedness in its raised terraces, stone pavers, and naturalized native plantings. 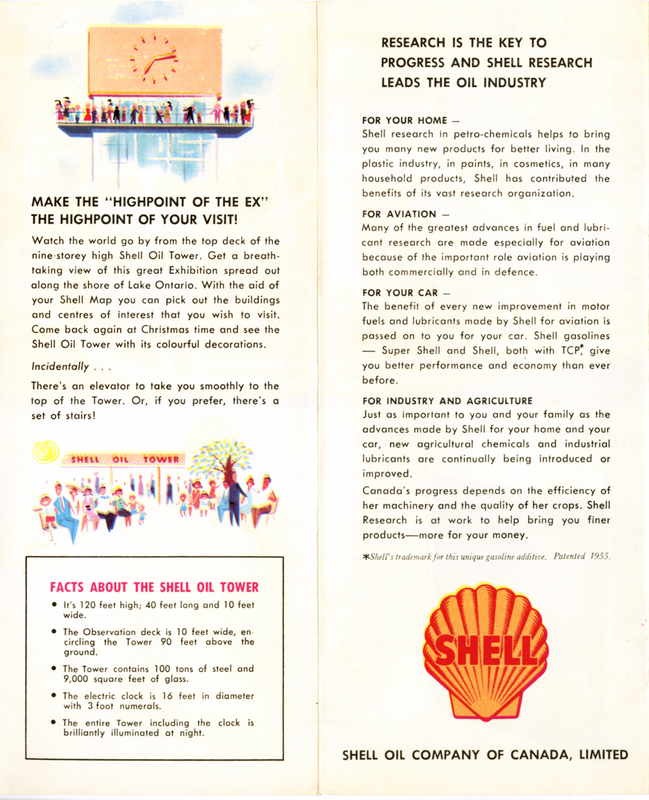 Based upon a winning competition entry by Toronto architect George Robb, the Shell Oil Tower was an Exhibition Place landmark from its completion in 1955 to its demise in 1985. The welded-steel and glass structure, the first of its kind in Toronto, extended 120 feet above the midway and provided fairgoers with panoramic views over the city and Lake Ontario from its open-air observation deck. Hardy patrons could eschew the elevator and climb twin staircases that scissored back and forth behind the glass walls, the equivalent of ascending a nine-storey building. Capping the tower was a giant clockface 16 feet in diameter, visible from across the fairgrounds, with hour markers three feet high. 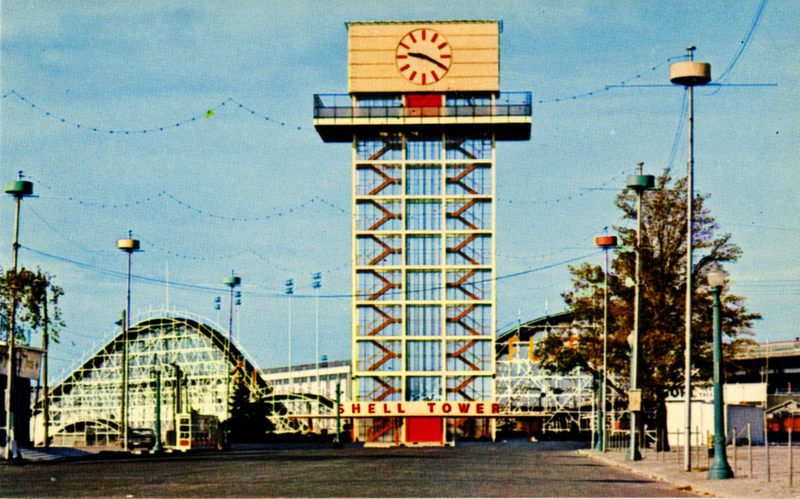 During the 1960s and 70s the Shell Oil Tower was renamed the Bulova Tower and traded its analog clockface for a then-new digital readout, but retained its popularity as a viewing platform and fairground meeting place. Elevator breakdowns and other maintenance issues led to its closing in 1983, however, and in 1985, despite protests from architects, preservationists and urbanists such as Jane Jacobs, the tower was demolished to make way for the first Molson Indy racetrack. 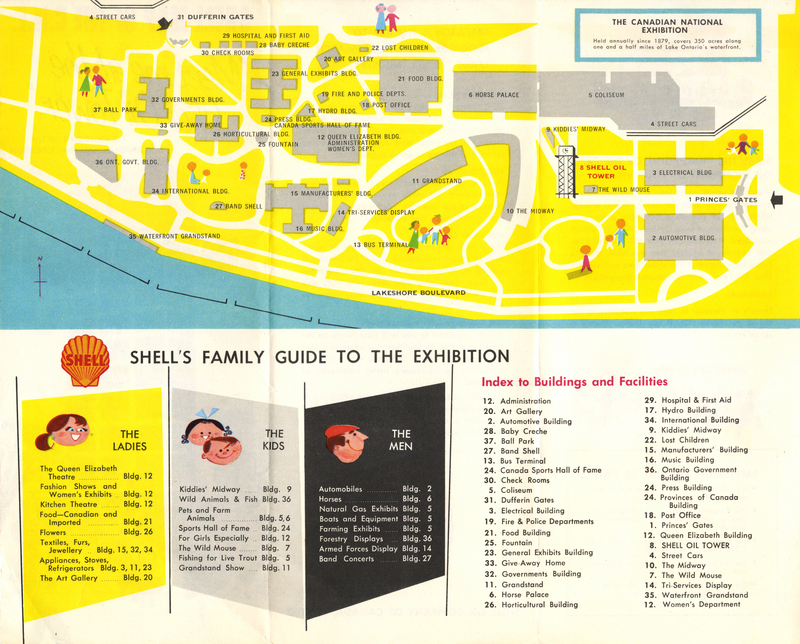 More about Exhibition Place’s Modernist buildings can be found here. 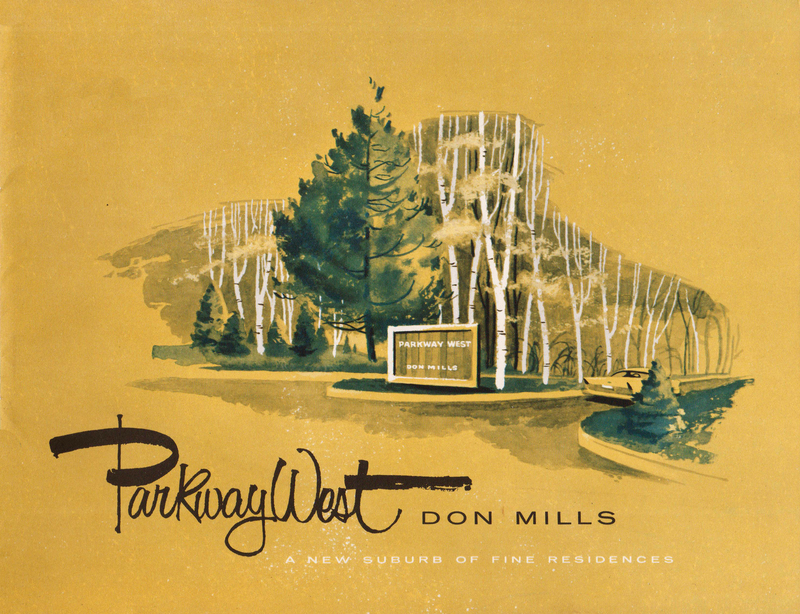 Buoyed by the success of their groundbreaking Don Mills garden city, in 1957 Don Mills Developments Limited launched its Parkway West community. 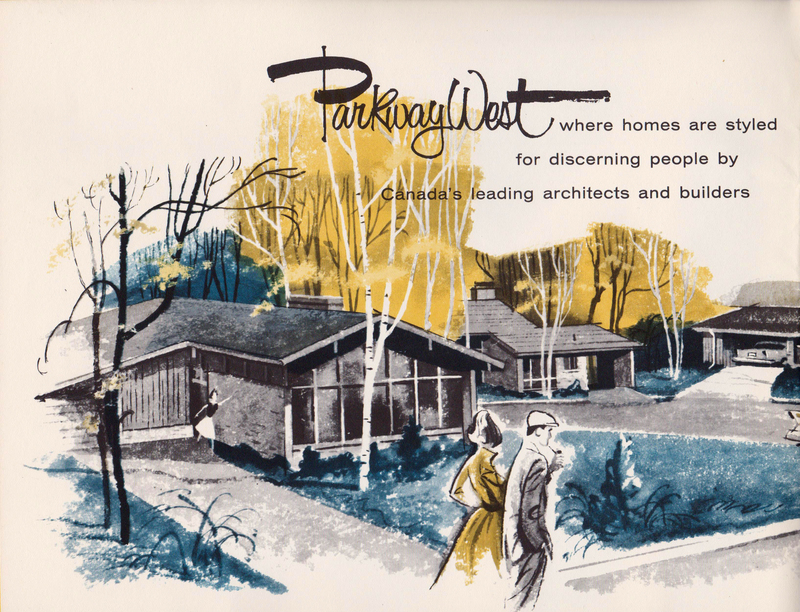 Located southwest of York Mills Road and the Don Valley Parkway, just a tee shot across the Don River from the original development, Parkway West was a more traditional suburban residential enclave targeted at the middle to upper-middle professional and managerial classes. The planning of Parkway West largely followed the principles established for Don Mills. 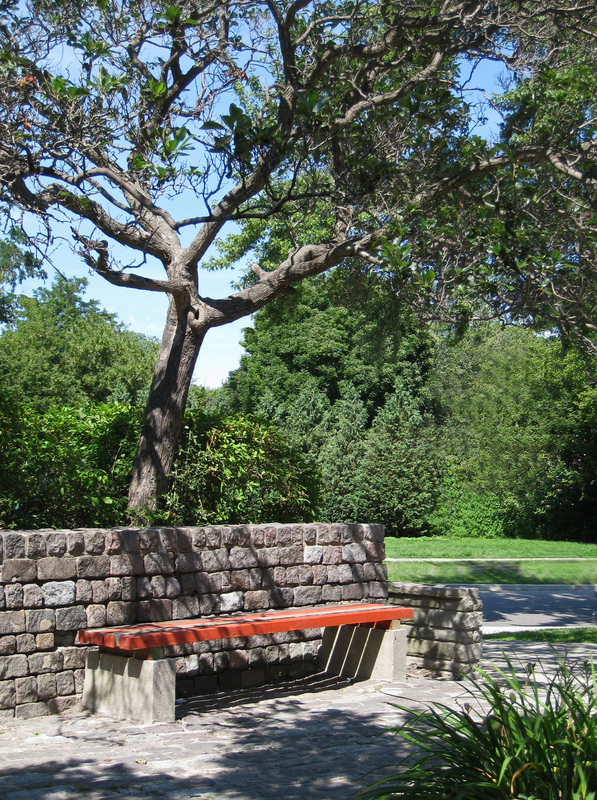 The wide boulevards of Laurentide Drive and Three Valleys Drive gently wound down the sloping hillside, linking a network of curving crescents and cul-de-sacs that extended south and west to the edges of the Don River ravine. Lots were substantial, boasting wide frontages, generous setbacks and unbroken vistas of well-kept lawns. Amenities included the luxurious Donalda Club, whose golf greens blended with the naturalized parks and greenbelts of mature trees. 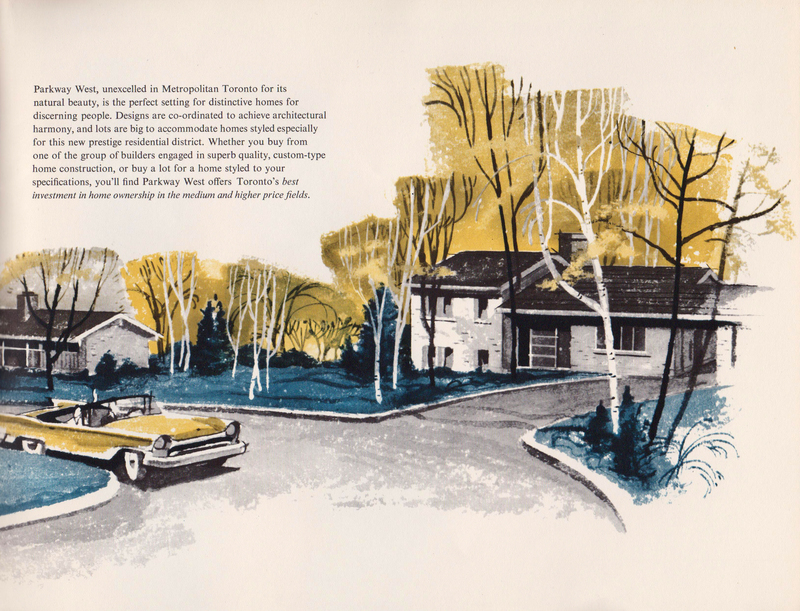 The development model also followed that of Don Mills: Don Mills Developments built the civil infrastructure and sold serviced lots, either to approved design-builders or to private owners who then directly commissioned their own residences. The Yarmon residence at 12 Spinney Court, designed by Henry Fliess, is a notable owner-commissioned example. Nisco Construction was one of the Don Mills builders also selected for Parkway West. 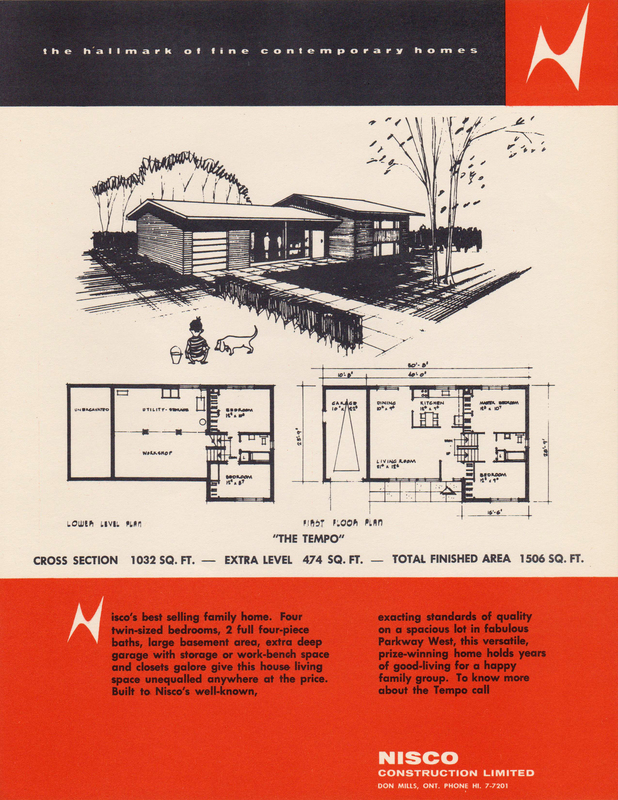 In the spring of 1957 the firm brought to market 14 houses in five different styles, with prices ranging from a Crest semi-detached at $17,500 to an Executive on a prime ravine lot at $27,900. 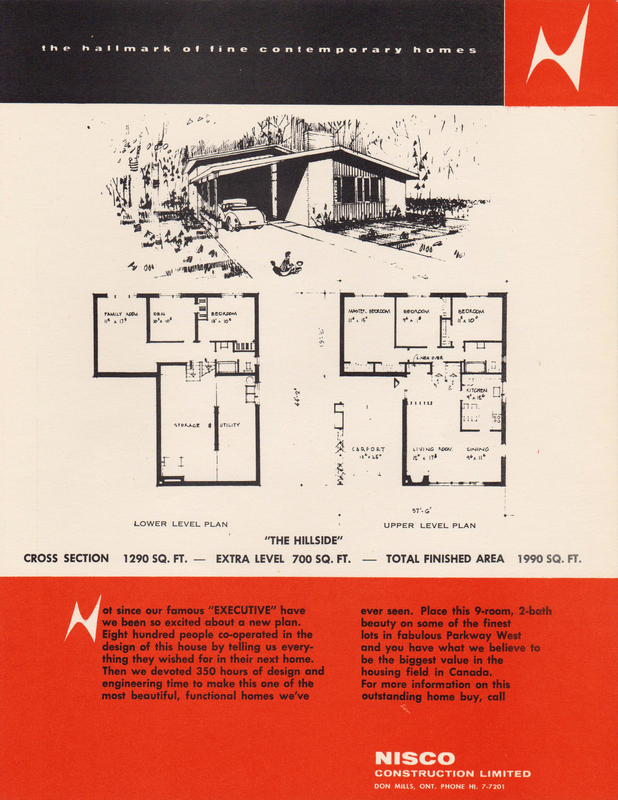 The architecture of the Nisco offerings was a conservative, moderate Modernism, less advanced than some of the original Don Mills housing but in line with the rest of Parkway West and similar upscale Toronto-area developments. 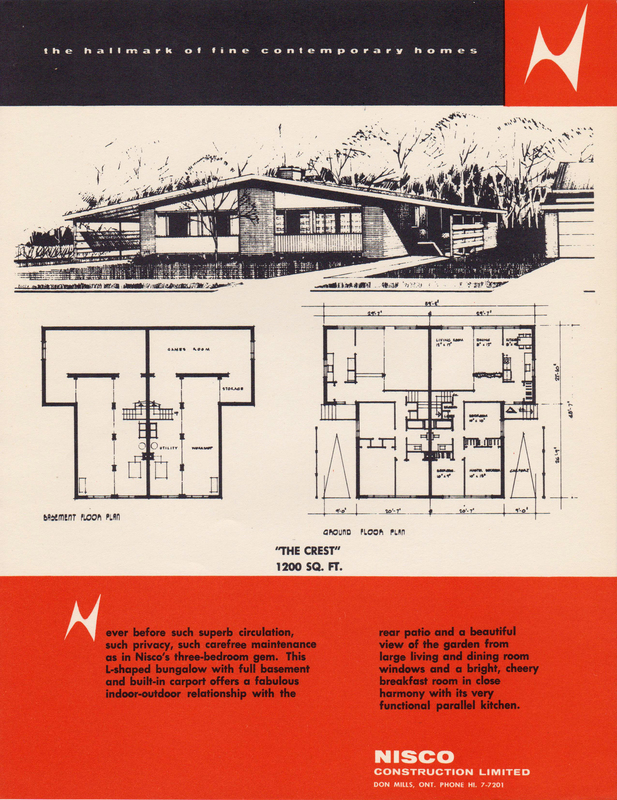 All but the Crest incorporated then-new split-level planning, combining the space efficiency of a two-level home with the convenience and low-slung roofline of a single-storey rancher. The fashionably low profiles were further enhanced by embedding the lower storeys partly below grade or into the slope of the lot. 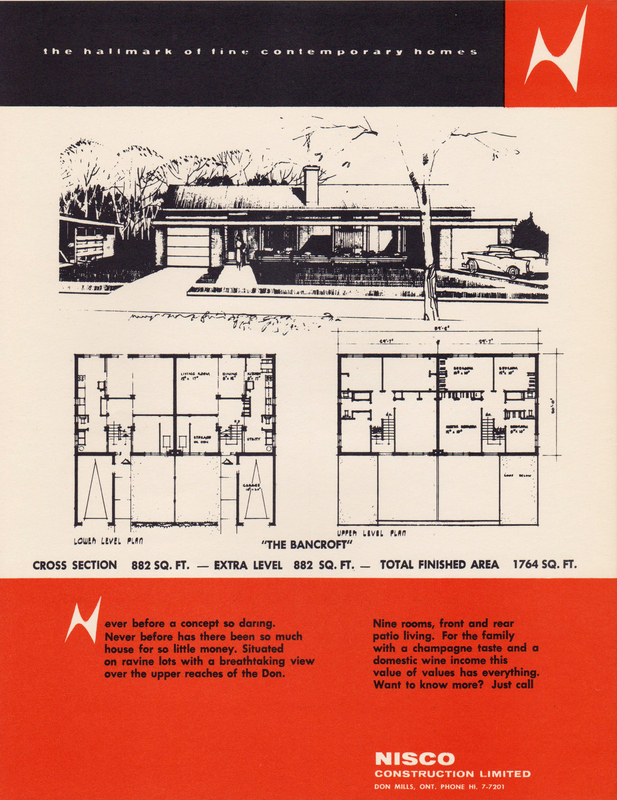 Interior planning emphasized the primacy of family life, with the open-plan living / dining area and kitchen as the communal nucleus of the home. There were no private ensuite bathrooms, even in the top-of-the-line Executive, although Dad was given a den to escape to with his fly-fishing gear and Canadian Club. Attached carports or garages were a prominent feature of all models, a place to display the bejeweled tailfins of the latest Buick Roadmaster or Monarch Turnpike Cruiser. Despite the emphasis placed upon the architects of the original Don Mills development, the authorship of the Nisco homes in Parkway West is unclear. Toronto architect Norman R. Stone is credited with the design of the Executive; the others are unattributed and may also be by Stone, although the Bancroft closely resembles earlier Don Mills houses by James Murray. 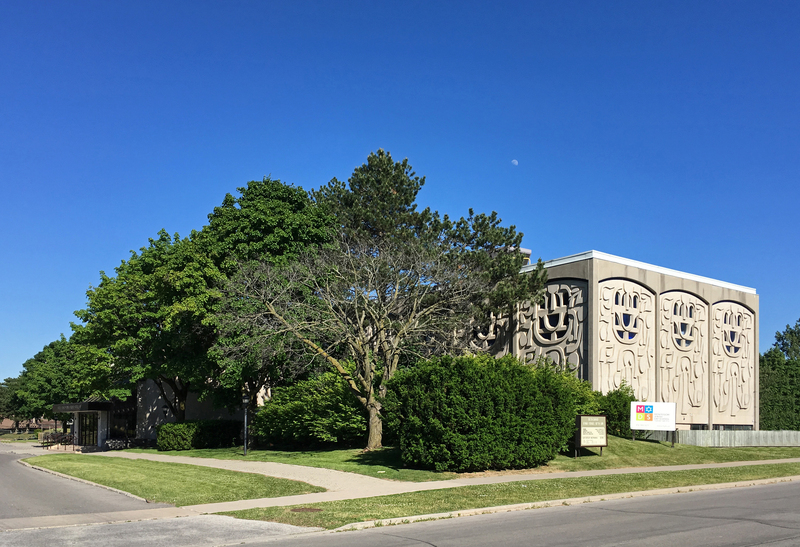 Following the close of the Second World War, much of Toronto’s Jewish community began a northerly migration along the Bathurst Street corridor, moving throughout the sprawling new suburbs of North York to the northern edge of Metro Toronto. 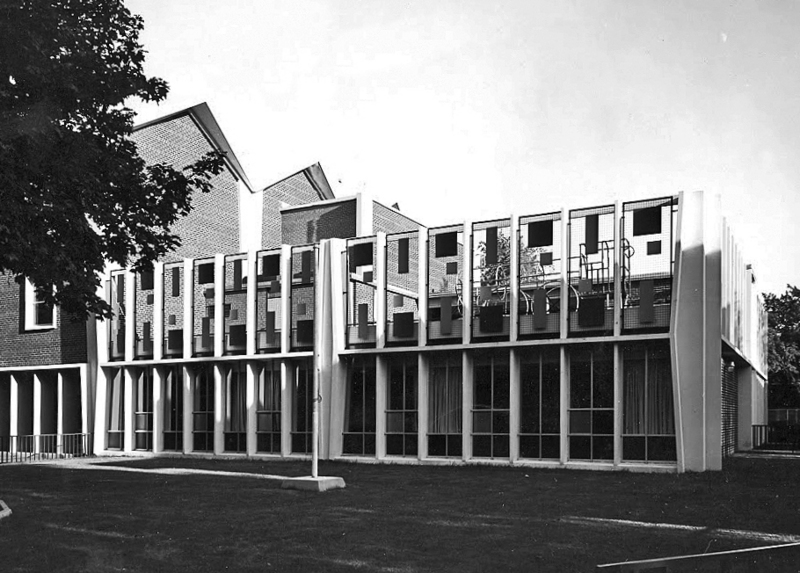 This mix of Orthodox and more liberal congregations, many newly-formed, looked to Modernist architecture as an expression of their religious faith and their confidence in the future, both in a new postwar suburban world and, for those who had left war-ravaged Europe, in a fresh beginning in an entirely new country. 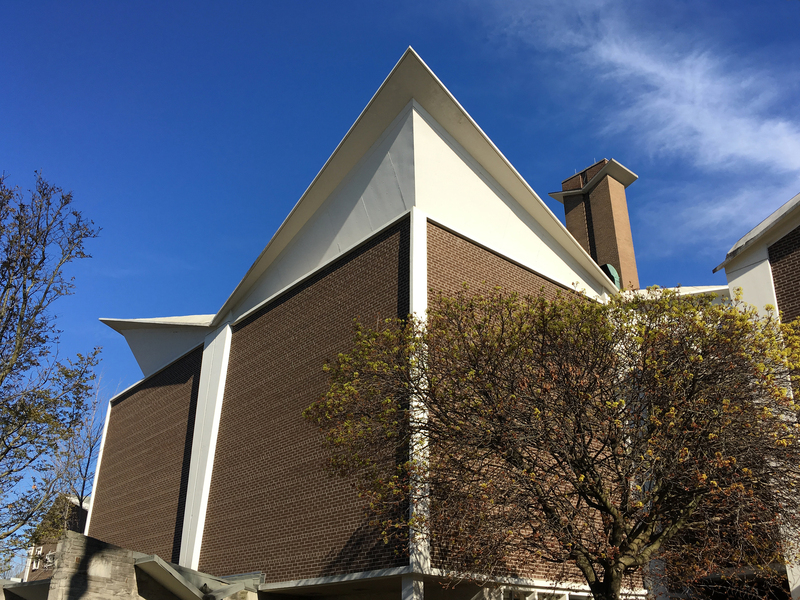 Responding to this need, Irving Grossman, then a promising young Toronto architect, designed a series of synagogues that deftly integrated traditional Hebrew imagery and ritual with the rapidly-evolving language of Modernist architecture. 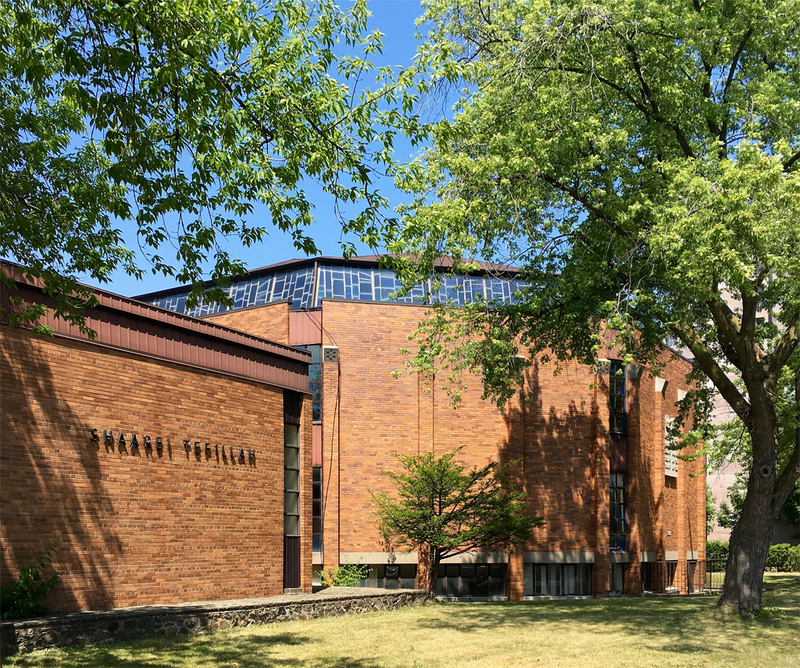 One of Grossman’s earliest works for the Jewish community was the Beth David B’Nai Israel Beth Am Synagogue, completed in 1959 at 55 Yeomans Road. 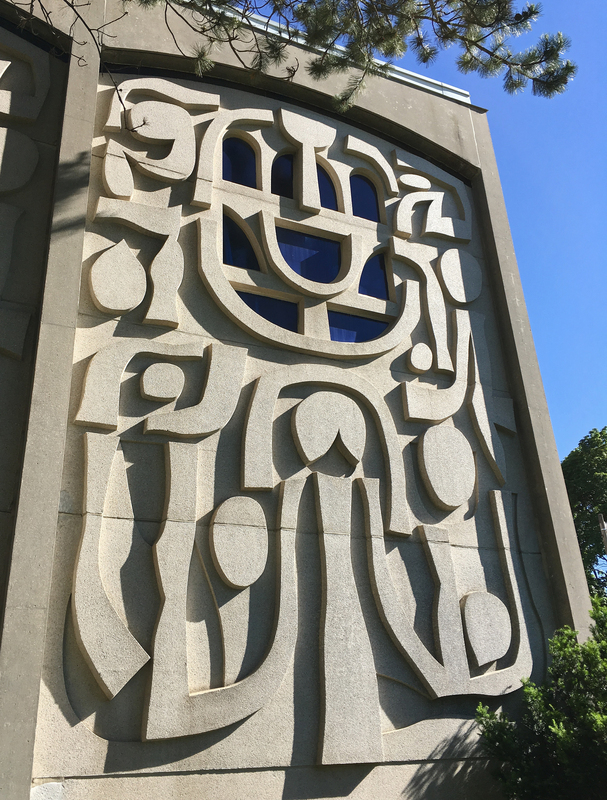 Conceived by Grossman as a richly decorated jewel box, the rectangular form of Beth David was completely wrapped in concrete bas-relief panels, each deeply sculpted with abstracted interpretations of traditional Hebrew iconography. In a rich contrast of light and shadow, the panels express the menorah, the sacred wine goblet and the tree of life, while curves of glass represent the cupped hands of the high priest. This evocative fusion of art and architecture was developed in collaboration with Graham Coughtry, a rising star in the Toronto art world with whom Grossman shared a studio building. And the design proved surprisingly cost-effective: the precast panels cost little more than a plain cladding and their modular construction eased future expansion. Some distance south at 3600 Bathurst Street is the 1963 Shaarei Tefillah. Faced with a constricted site and heavy vehicle traffic, Grossman turned the complex inward, arranging around an inset courtyard an octagonal-shaped sanctuary on the prominent northeast corner and a rectangular assembly hall to the south. 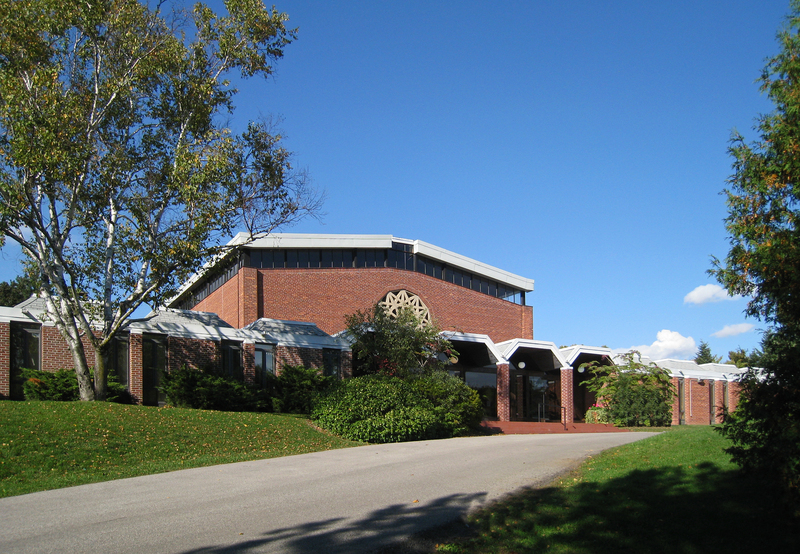 The sanctuary is placed close to the sidewalk on two sides, its flat planes of orange-brown brick separated by inset slit windows and ornamented with vertical piers capped by the Star of David. Above the walls is a ring of stained-glass clerestories, filtering natural light through cool tones of blue, green and violet. Seating in the sanctuary is also octagonal, as per Ashkenazic requirements, with an upper gallery tucked beneath the timber-beamed roof. Sunlight streams down through an octagonal skylight to illuminate the central bema. 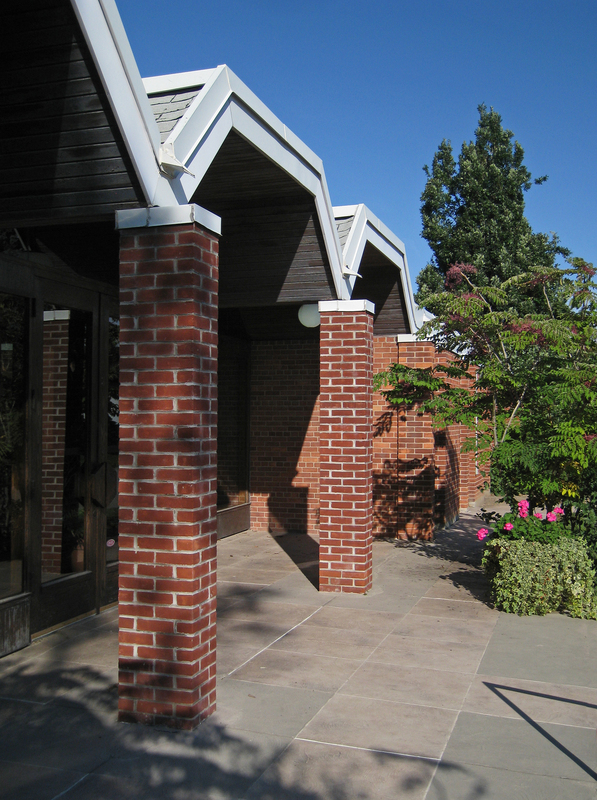 Grossman’s Temple Emanu-El, completed in 1963 for a reform congregation, is by contrast set within a bucolic acreage at the end of Old Colony Road. Its long, low red-brick base nestles into the crest of a grassy slope, topped by the cubic form of the sanctuary volume and an ethereally floating roof of glass and steel. The generous south-facing entrance, sheltered by a row of mansard roofs, evokes a sun-kissed California feel and leads to the main sanctuary space. Here, rows of parliamentary-style seating face each other in the Sephardic tradition, washed in natural light from above and through the massive Star of David-shaped aperture over the bema. 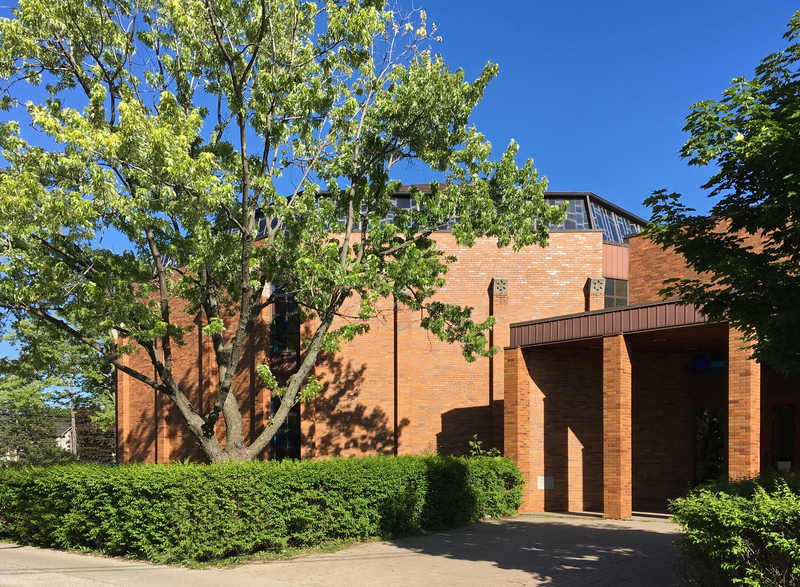 Red brick walls and dark-stained cedar link the interior and exterior and complete a warm, comforting and uplifting environment for spiritual contemplation. 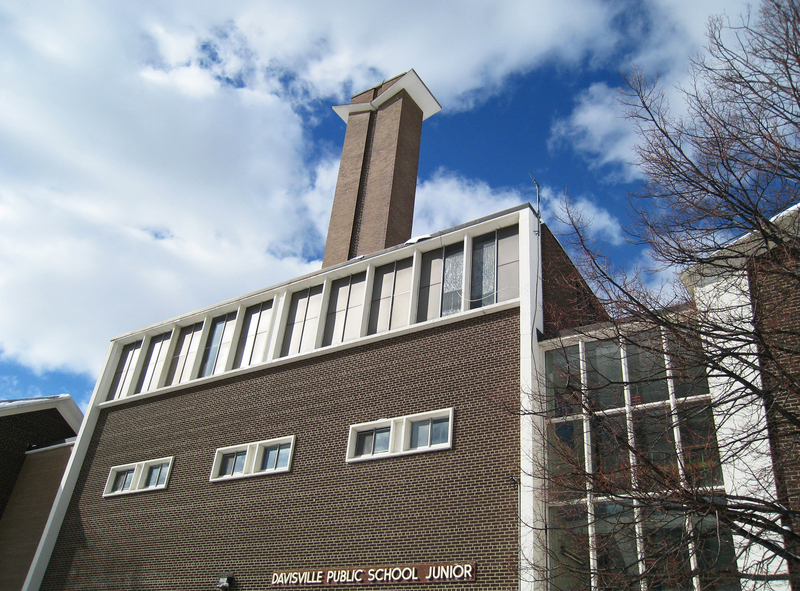 A reprieve for Davisville Public School? 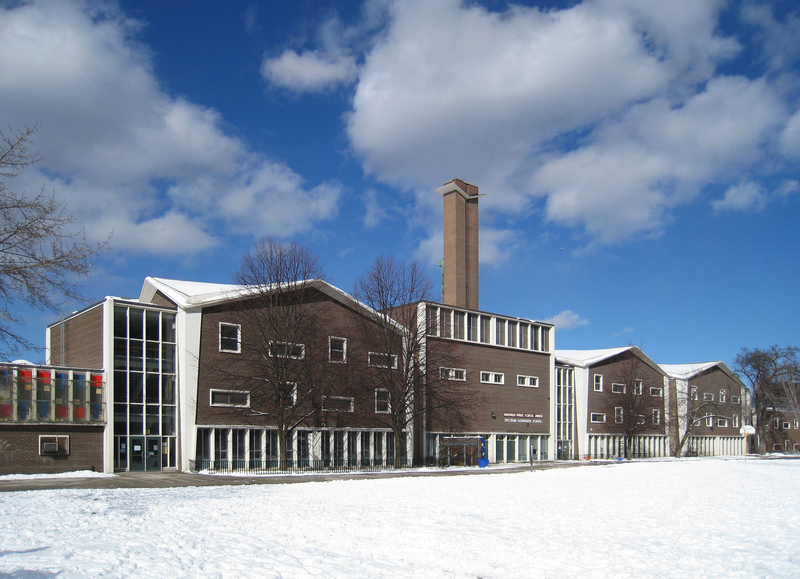 Opened in 1962 at 43 Millwood Road, the Davisville Public School and Metro Toronto School for the Deaf is one of the many innovative school buildings designed by the Toronto Board of Education during the 1950s and early 1960s. Frederick Etherington, the board’s chief architect, and primary design architect Peter Pennington led in-house teams of architects and engineers in addition to overseeing schools commissioned from major Toronto architecture firms. 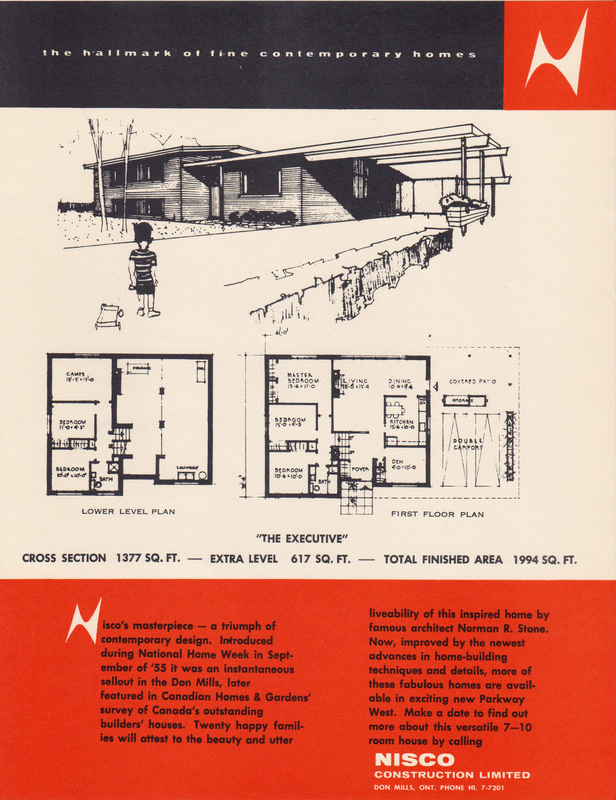 Davisville was designed to enrich the daily experiences of its young charges, introducing surprise and delight into a relatively straightforward building program. The school is divided into four modules of three storeys each, as opposed to the typically long, linear designs of the day, which helps to visually break up the building mass into more child-size pieces. The lower two-storey module at the west end encloses protected indoor-outdoor play areas; the easternmost module is a later addition. Roofs are exotic hyperbolic paraboloids, their animated forms held aloft at each corner by concrete columns that neatly taper inward toward the ground. Staircases separate each module, aiding vertical circulation, and provide treetop views of the outdoors through walls of transparent glass. Windows on the upper floors march across the facades in a jazzy syncopated rhythm of alternating verticals and horizontals. Welcoming students is the entrance module with its deep, sheltering canopy and a dramatically upward-flaring paraboloid roof, an inversion of those atop the other modules. The limestone walls flanking the entrance pass through a glazed wall into the lobby, the smooth and transparent glass intriguingly contrasting the roughly textured stone. Inside, the lobby is outfitted with colourful terrazzo floors and sleek fittings of stainless steel and black walnut. Throughout the building, thoughtful design, high-quality materials and fine workmanship demonstrate the importance assigned to public education during the postwar period and its key role in developing citizens of a democratic civil society. 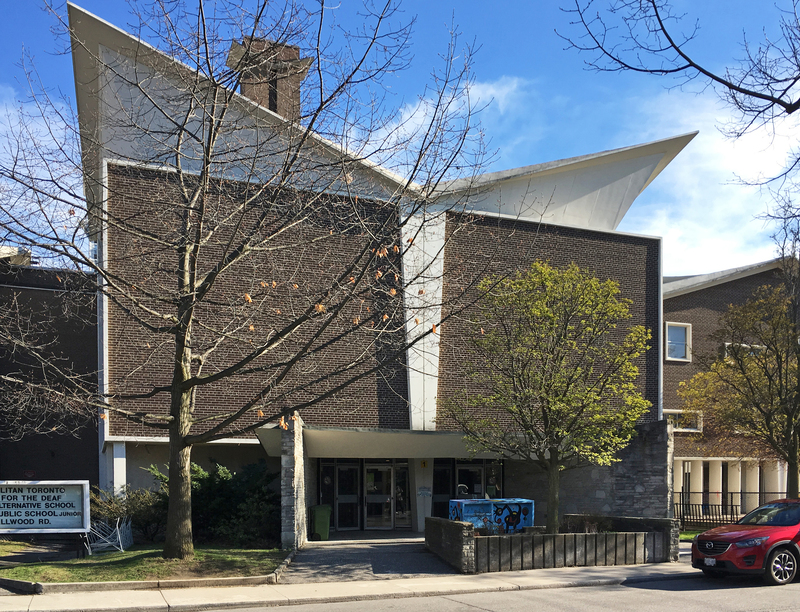 Despite these virtues, the Davisville school is currently under threat of demolition in favour of a new school building and an adjoining community hub with a swimming pool, underground parking and other amenities. With a minimum of ingenuity, however, these elements can be readily arranged on the site without demolishing the existing school building. The school can be renovated and repurposed as the community centre, perhaps with space leased to arts groups, small independent schools or other community organizations; the building’s modular design lends itself to additions and internal subdivisions. And even if heritage value is discounted, the Davisville school building is a useful physical asset for the board and the community. Why not keep it and creatively leverage its potential? With the Canadian Centennial approaching in 1967, the Government of Canada launched an ambitious program to build national identity and enrich public life through new facilities for the arts, culture, recreation and education. 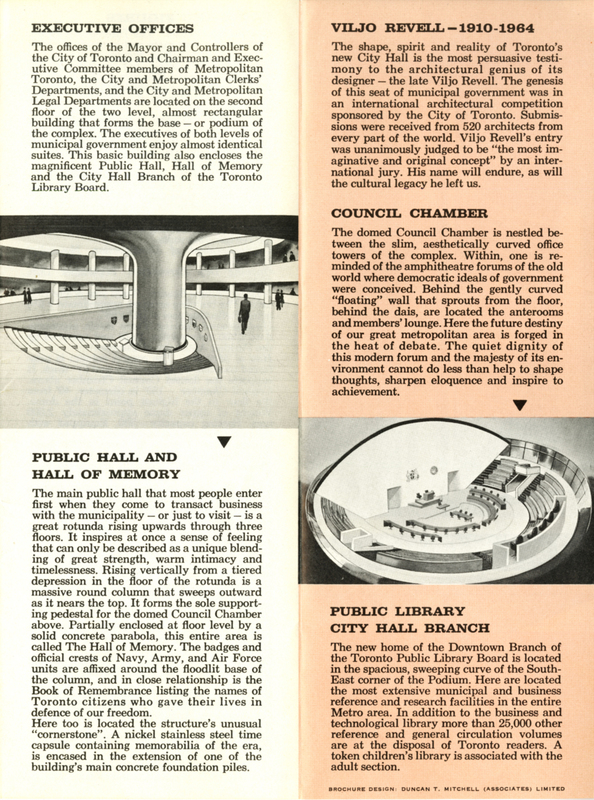 Led by the federal Centennial Commission, in collaboration with provincial and municipal governments, the resulting Centennial projects ranged from large-scale institutions such as the National Arts Centre in Ottawa, the Confederation Centre of the Arts in Charlottetown and the Ontario Science Centre in Toronto to literally hundreds of libraries, recreation centres and performing-arts venues in communities across the country. 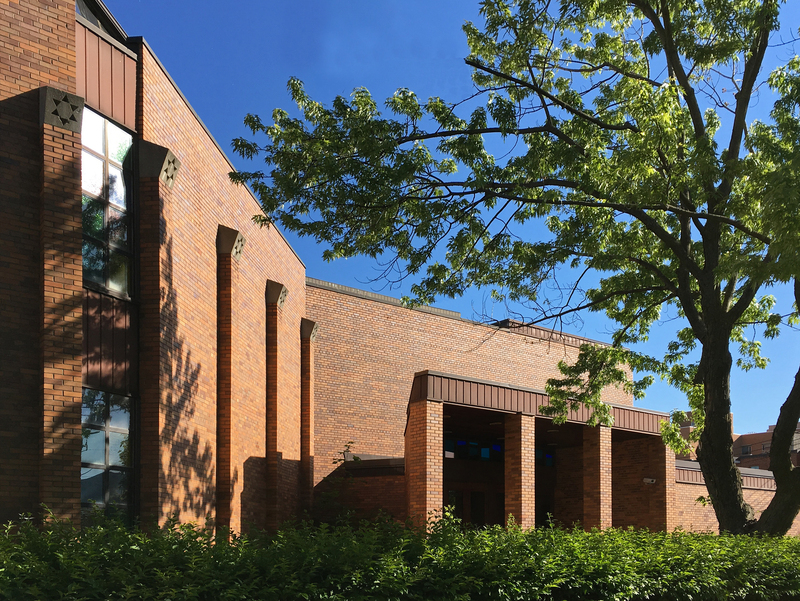 Taking advantage of this funding largesse, the Town of Mimico (soon to be amalgamated into the Borough of Etobicoke) opted to commission a new central library to replace their aging 1915 Carnegie building. 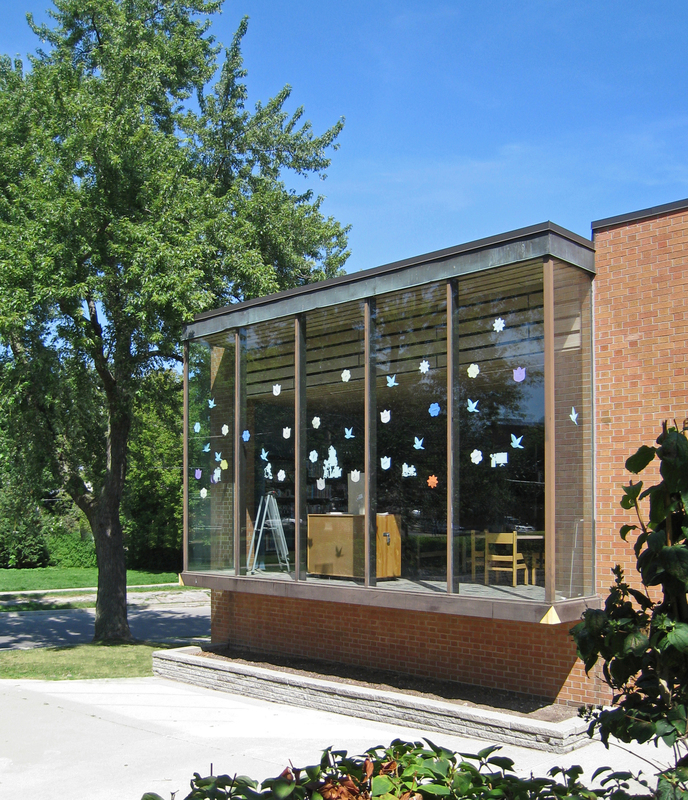 The Mimico Centennial Library, opened in late 1966 at 47 Station Road, earned architects Banz, Brook, Carruthers, Grierson, Shaw a coveted Massey Medal for Architecture in 1967. 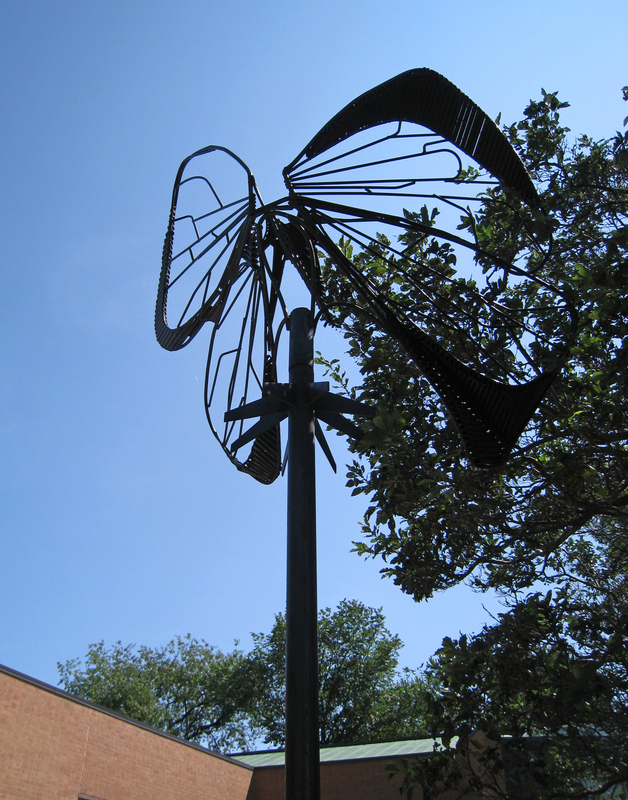 Set into a compact, sloping site, the Mimico library takes on an irregular L shape, wrapped around a charmingly cobblestoned garden court by landscape architect Michael Hough and a butterfly fountain sculpture by Ron Baird. The sculptural plasticity of Brutalism is evident in the building’s angular, abstract shapes and free-form projections, but the style’s sometimes overbearing effect is tempered by its realization in a refined red-orange brick rather than raw concrete. A roof of greenish weathered copper attractively caps the composition. The lush, mature landscaping and the deft handling of scale, mass and siting further help to integrate the library into its otherwise unassuming residential neighbourhood. Inside, a central checkout desk divides the children’s wing from the main library. The children’s wing overlooks the entrance garden court through a floor-to-ceiling glass box, which extends from the building to form a daydreamy reading nook and observation post. The main library area is on two levels, with bookstacks tucked underneath an open mezzanine level above. Open and airy, the space is daylit from all sides by strategically-placed slit windows; natural cedar ceilings contrast the smooth white plaster walls and the elegant roof structure of black steel. The main floor extends into a second projecting volume, also overlooking the entrance garden, that houses a reading lounge convivially arranged around a large circular coffee table. On the lowest level is a 240-seat sloped-floor auditorium for public events and performances. 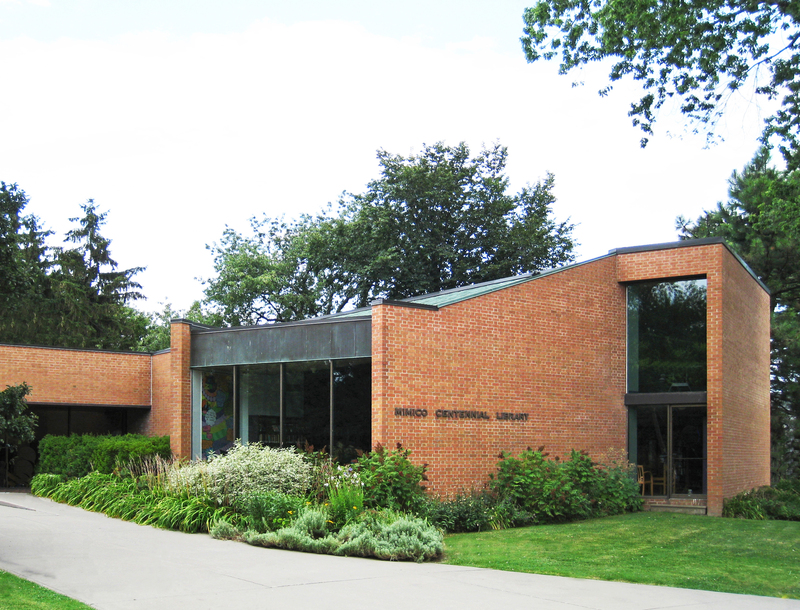 Toronto-based Banz, Brook, Carruthers, Grierson, Shaw (and its various iterations) was for many years a specialist in public libraries and other community facilities. 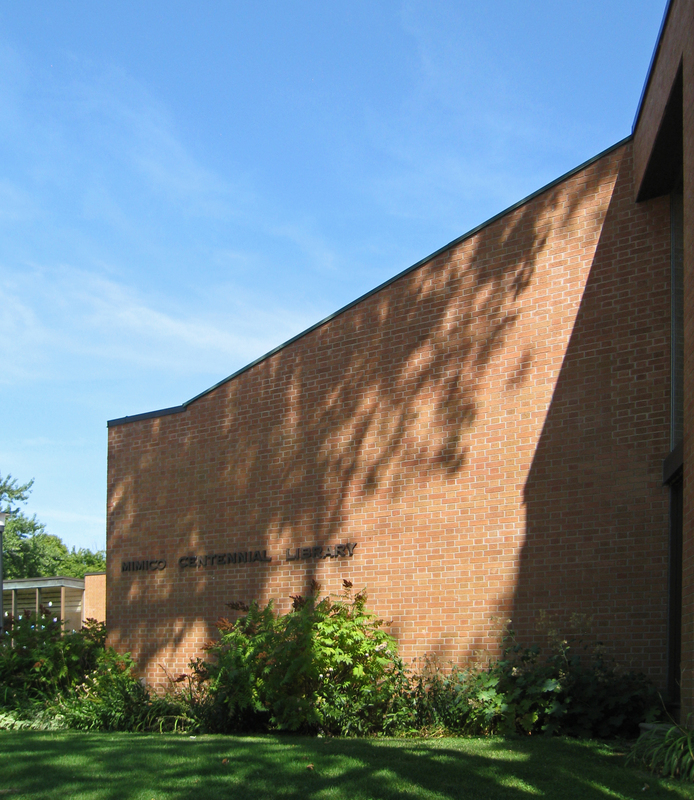 The Mimico library can be considered a stylistic midway point in the firm’s evolution from the simple c.1960 brick-and-glass pavilions for the Richmond Hill and Port Credit libraries toward the larger, more complex and more uncompromisingly Brutalist 1970s Burlington Public Library and North York Fairview Branch Library. The firm continues today as CS&P Architects. 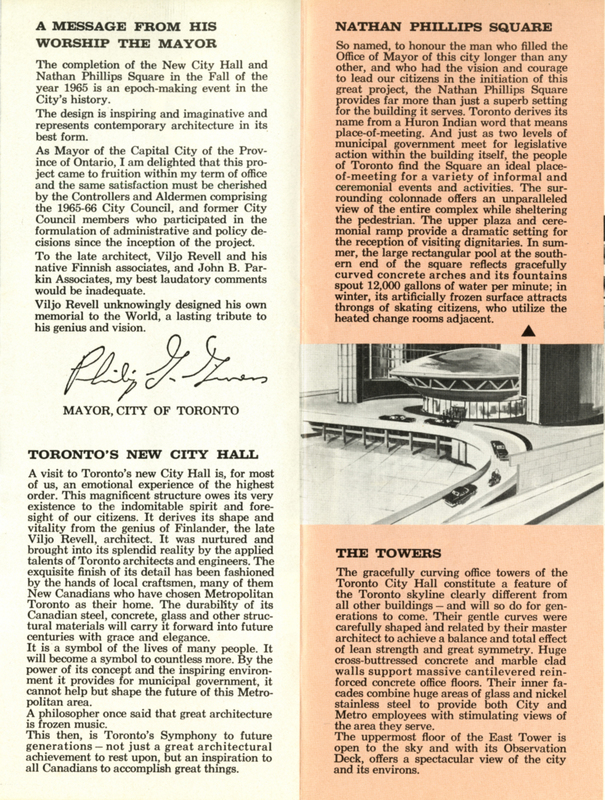 Opened in September 1965, Viljo Revell’s new Toronto City Hall signified a coming of age for Toronto; over the subsequent decades, it has confirmed its status as a beloved civic symbol and an international icon of Modernist architecture. This fall, a 50th anniversary retrospective documented City Hall’s creation process and its ongoing legacy through no less than two new books, an online exhibit and an exhibition at Ryerson University. City Hall was intended to be a landmark right from the much-publicized launch of its international design competition in 1957. Among the postcards and other promotional fanfare heralding its grand opening is the visitors’ guide A Dramatic Symbol of a Progressive City. 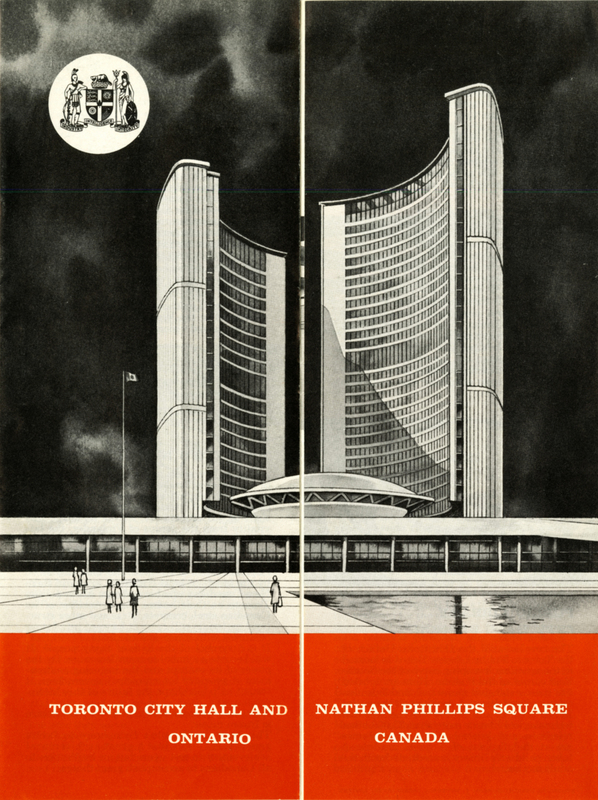 The guide describes how City Hall came into being and directs the visitor through its architectural marvels: the twin curving towers, the main public hall and Hall of Memory, the saucer-shaped council chamber and the expansive Nathan Phillips Square. Today, in perhaps the most significant tribute to the vision of Revell and his Canadian collaborators, almost all of it has been preserved and renewed for another fifty years and more.